Spinal pain is an extremely common problem that we see in our chiropractic centers. There are a number of potential causes for spinal pain, and chiropractors, as spine and nerve system specialists, can help determine what those causes are. Chiropractic is one of the most effective approaches to help you address your spinal pain, feel better, and strengthen your spine overall. Related Blog Post: Do I Have a ‘Slipped’ Disc? Injury and damage to your spinal discs can be an important part of understanding the cause of your pain. At the same time, traditional medical can fall short as medical doctors may focus solely on the disc without understanding how interrelated the various components of your spine are. It is very common for a person to come into one of our chiropractic centers after having been diagnosed with a ‘slipped’ disc by a medical specialist. It is always our protocol to do a thorough consultation and chiropractic spinal examination before providing chiropractic care. We need to understand the cause of a person’s problem before we can determine the best way to help them. We first need to answer the question: Are they a candidate for chiropractic care? We often find that when a person has been diagnosed with a ‘slipped’ disc, the medical doctor did a very cursory consultation and little to no physical examination of the area in pain. An MRI may have been conducted, but, often, very little attempt has been made to thoroughly understand what has caused the spinal injury. It is often very convenient to label a person’s spinal problem as a ‘slipped’ disc or a disc injury. If you have been diagnosed with a ‘slipped’ disc, ask your medical doctor what has caused the condition. If they do not have a convincing answer, schedule a spinal checkup, to receive a second opinion by a qualified Doctor of Chiropractic. Your spinal discs are one component of the complex series of structures that comprise your spine. Think of your spinal discs as shock-absorbing pads between your spinal bones. These pads help to guide the motion of your spine and to provide support to your spinal joints. Your spinal discs are made of fibro-cartilage, which is one of the most durable types of cartilage of the human body. They are firmly anchored to your spinal bones and receive nutrition through the various movements of your spine. Spinal misalignments can lead to a variety of health problems. Most notably, misalignments can weaken your spinal discs over time. Spinal misalignments will often lead to fixations in your spinal joints and restricted movement of your spine. In many cases, you’ll feel tightness, stiffness, and a lack of mobility in your spine as a result. If your spine is not healthy, flexible, and moving well, your discs will not receive the nutrients they need in order to be healthy. Over time, your discs will wear down and degenerate. Degenerative arthritis may develop as a result. A spine that moves well, will be healthy. That is why being mobile and active is so important: use it or lose it. When your spinal bones fall out of alignment, those misalignment bones will cause abnormal, unbalanced and increased stress to your discs. This asymmetrical force can further weaken the structural integrity of your discs causing them to bulge, herniate, protrude or potentially prolapse. These are technical terms for ‘slipped’ disc. Imagine that the front-end of your car is out of alignment. Over time, if the alignment of your car is out of balance, your tires will wear down faster and become damaged as they try to compensate for the odd alignment. 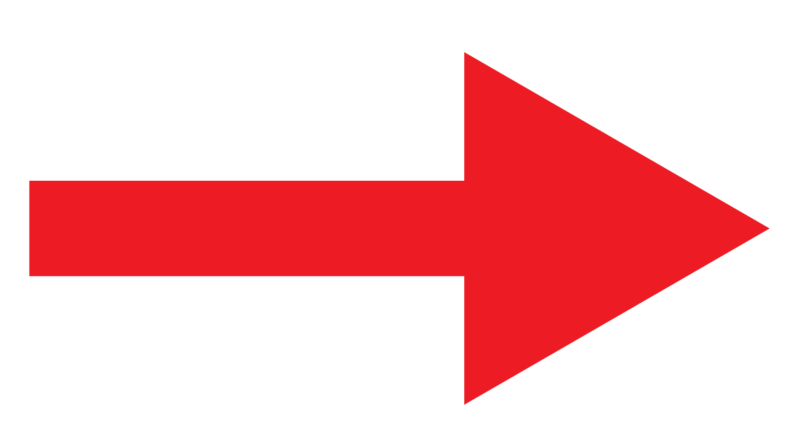 The tire damage is not caused by an inherent tire problem, such as a defective tire; the damage is caused by a global, whole-car alignment problem. The tire damage is an effect of the bad alignment of the car. Likewise, most cases of disc injury are not caused by a “defective” spinal disc. Discs become damaged because of the abnormal stresses and forces that are applied to them over time. Spinal misalignments, known as subluxations, weaken and damage your discs by increasing the force of gravity on those structures. Also, a misaligned spine will transmit more force to the disc when you experience a traumatic event, like a slip and fall or sports injury. 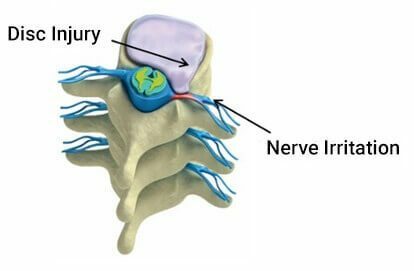 Once this occur, the disc can damage nerves and your spinal cord directly. This is not a small problem. 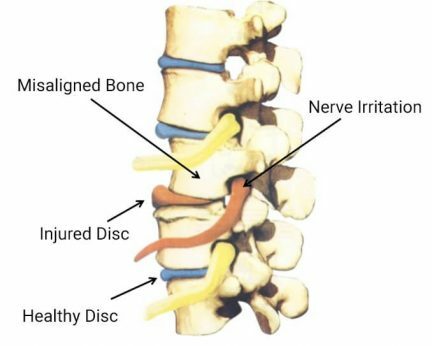 If you are dealing with spinal misalignments damaging and weakening your spinal discs, then disc is actually an effect of a deeper problem, not the cause of your pain. To truly resolve this problem you need to restore the alignment of your spine through chiropractic adjustments and appropriate spinal rehabilitation protocols. The first step in understanding the cause of your spine problem is to schedule a checkup in one of our chiropractic centers. There is no reason to continue dealing and living with pain and health problems. Nor should you live numbing your body further with ineffective, temporary treatments.